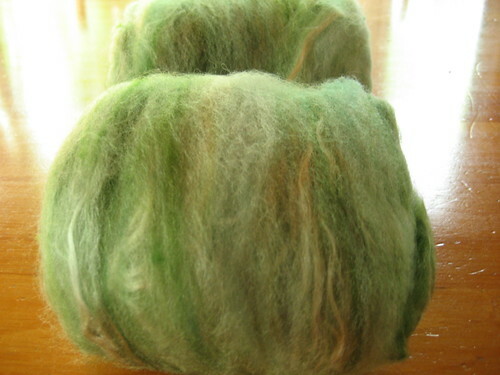 I've spun nearly one full bobbin and still have about half of the fibre left to turn into singles. Once that is finished, it will be time to ply. I'm thinking I'm going to Navajo ply these singles into a worsted weight yarn. I should end up with about 300 yards if all goes well. That would be enough to make a cozy scarf or a nice pair of mitts next winter. While working away on this, I realized how little green has made its way into my craft projects. 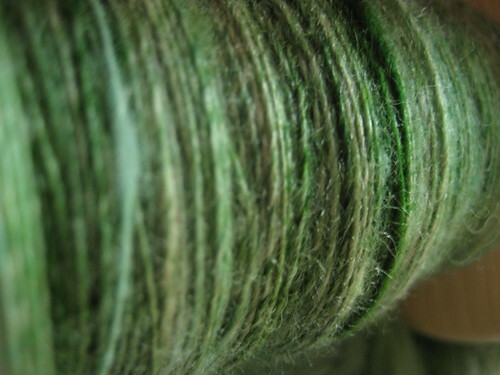 I have some green yarn stocked away in the stash but I don't think I've ever knit anything that had green as its main colour. Seems bizarre given my general love of all colours. Up next, my summer knitting project that is *eep* almost finished! Posted by Amanda at 9:15 p.m.